Model updates: Honda create a fresh new take on custom cool with the A2 Licence-friendly 500cc parallel twin-cylinder Rebel. Mixing old and new school style it’s an engaging and easy machine to ride, and offers plenty of scope for owner customisation. 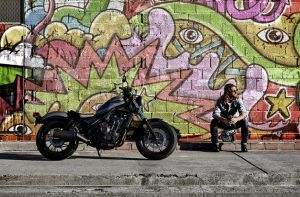 For many riders in their early 20s – Generation Y, who have grown up through the digital age – motorcycles mean so much more than just transport. They need to represent a lifestyle, an attitude, and to allow them to express their own individual identity. These riders’ expectations are different to those of the motorcycling mainstream and the machines that speak to them reflect this. They have to fit in with their life but must also contain the potential for further individualisation. Mr Keita Mikura, Large Project Leader (LPL) of the innovative NM4 Vultus* understands this. He likes to play with the rules, creating machines that fuse tradition with groundbreaking new ideas and perspectives. Mikura-san is the Large Project Leader of the new Honda Rebel. His team has produced a custom motorcycle that showcases a classic, timeless look but is also imbued with a forward-looking, contemporary style all of its own. Accessible, easy to ride and easy to live with, the Rebel goes its own way but is also a blank canvas, ready for whatever its owner’s imagination has in store for it. Development of the Rebel began in North America, with an outlook geared toward firing the imagination of a younger generation of riders in a different way to traditional cruiser motorcycles. Powered by a 471cc parallel twin-cylinder engine, with strong bottom end torque and a smooth, linear power delivery the Rebel is A2 licence friendly. It’s also slim, with a low seat height and therefore easy to manage at low speeds. The riding position is relaxed and neutral, with gently outstretched arms matched to mid-mounted footpegs. Two key words ran headlined throughout the Rebel’s development programme: ‘SIMPLE’ and ‘RAW’. But to do so much with so little is an art form in itself, an exercise in minimalist design where every detail matters. And the Rebel does not disappoint; rolling on fat tyres its low and lean ‘bobber’ silhouette – crowned by the steeply raked 11.2L fuel tank and fat handlebars – sits the rider firmly ‘in’ the machine. From every angle of its stripped form it expresses an off-beat individuality. Everything that can be is blacked out, which highlights the Rebel’s lithe design as well as underlining the subtle paintwork. Set high up front the evocative round headlight features a 135mm diameter glass lens and die-cast aluminium mount. The ‘one button’ speedo is a compact 100mm dial with negative LCD display and blue backlight and is both striking and effective, while the ignition is housed below the left side of the fuel tank. The pillion pad and rear footpegs are easily removed, and a number of tailor-made accessories will be available for the Rebel; these include a tubular rear rack, saddlebags, screen and 12V socket. The Rebel’s 471cc 8-valve, liquid-cooled parallel twin-cylinder engine is drawn from the sporty CBR500R. For cruising duties, revised PGM-FI fuel injection mapping has shifted its character away from the high rpm-focused performance of the CBR to a torque-heavy bottom-end output, with smooth and linear delivery throughout the rev-range. Punchy maximum torque of 44.6Nm torque @ 6,000rpm combines with peak power of 33.5kW @ 8,500rpm. It’s a power unit that strikes a great balance between physical size and flexible output. Bore and stroke is set at 67mm x 66.8mm with compression ratio of 10.7:1. Internally the cylinder head uses roller rocker arms; shim-type valve adjustment allows them to be light, for lower valve-spring load and reduced friction. A silent (SV Chain) cam chain has the surface of its pins treated with Vanadium, reducing friction with increased protection against dust. Inlet valve diameter is 26.0mm with exhaust valve diameter of 21.5mm. Friction is reduced by the addition of striations on the piston skirt (a finish that increases surface area, introducing gaps in which oil can flow for better lubrication). An AB 1 salt bath process, used after isonite nitriding, forms a protective oxidisation membrane. The crankshaft pins are phased at 180° and a primary couple-balancer sits behind the cylinders, close to the bike’s centre of gravity. The primary and balancer gears use scissor gears, reducing noise. The crank counterweight is specifically shaped for couple-balance and its light weight allows the engine to spin freely, with reduced inertia. The crankcases use centrifugally cast thin-walled sleeves. Their internal design reduces the ‘pumping’ losses that can occur with a 180° phased firing order. A deep oil sump holds 3.2L. Slick to use up or down the six-speed gearbox is designed to offer effortless changes, especially around town. The 2-1 exhaust scrubs spent gases in its catalyser then speeds them through its first chamber into the second resonator chamber. The muffler outlines a 120mm diameter ‘shotgun’ style, and the sound produced has a heavy-duty pulsing feel that fits the torque delivery. To support the Rebel’s low-slung look its attractive tubular steel frame grips the engine in three places and is designed to be as narrow as possible around the rider’s inseam. Trail is set at 110mm with 28° rake; the forks are offset at 30° and the result, combined with the 1488mm wheelbase, is a low 690mm seat height and mid-mounted footpegs, for balanced and neutral steering. The frame includes an innovative rear loop that separates the seat from the textured metal mudguard; the bolt-on cast aluminium subframe provides further scope for customisation. At 230mm apart the 41mm front fork stanchions are set wide for handling rigidity, comfort and style. The tubular steel swingarm has a 45mm diameter and works twin shock absorbers that feature 2 step preload settings. Dunlop tyres are fitted as standard sized 130/90-16 front and 150/80-16 rear. The style of the 16-inch cast aluminium wheels is crisp and simple, with the 264mm front disc acting as mirror to the spoke pattern. A twin-piston front caliper is matched by a single-piston rear; ABS is fitted as standard.